"Usually, a discovery is not made in the easiest but on a complicated way; the simple cases show up only later". 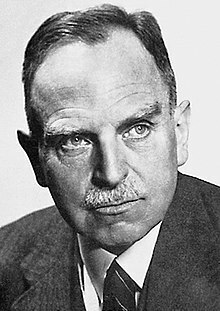 Otto Hahn (8 March 1879 – 28 July 1968) was a German chemist and winner of the 1944 Nobel Prize in Chemistry "for his discovery of nuclear fission". He is considered a pioneer of radioactivity and radiochemistry. Gewönlich wird eine Entdeckung nicht auf den einfachsten, sondern auf einem komplizierten Wege gemacht; die einfachen Fälle zeigen sich erst später. Usually, a discovery is not made in the easiest but on a complicated way; the simple cases show up only later. Vom Radiothor zur Uranspaltung. Eine wissenschaftliche Selbstbiographie (1962). Never has a Nobelprize-winner been in the outward sense so absent at a Nobel festival as Professor Hahn. And I suppose, too, that no Nobelprize-winner has ever, through the consequences of his discoveries, been so intensely present to our consciousness. Alfred Nobel hoped that in dynamite he had discovered such a powerful explosive that future wars would be impossible. The hope was not fulfilled; but dynamite is used today mostly for peaceful purposes. May we venture to hope the same of atomic energy? Hahn's discovery of the cleavage of atoms is the crowning feat, so far, in a series of discoveries for which Nobelprizes have been awarded. We acclaim today this celebrated researcher's scientific achievements. Prof. Dr. Axel Hugo Theorell at the Nobelprize ceremony, Stockholm, December 10th, 1945. Otto Hahn is a figure of world history. But he possesses none of the attributes of the traditional luminaries in history books. His slight, somewhat bowed figure, which with its high brow has the effect of his features having been carved, with his expression of searching honesty and critical inviolability, have something of a boundless nobility about them. The Observer, London, June 9th, 1957. His father city Frankfurt am Main thus honours a scholar of worldwide fame, who, as a result of his trail-blazing discoveries in the sphere of atomic research, radioactivity and radiochemistry, enjoys a surpassing reputation in the world. The city at the same time stresses its bonds with a personality of exceptional talent and creative energy, whose scientific and administrative work serve progress and the well-being of the whole of humanity. The attestation of honorary citizenship in the diploma of the City of Frankfurt am Main, 1959. Hahn and Strassmann were able to discover nuclear fission by exceptionally good chemistry, fantastically good chemistry, which was way ahead of what anyone else was capable of at that time. The Americans learned it to do later. But at that time, in 1938, Hahn and Strassmann were really the only ones who could do it, because they were such good chemists. Prof. Dr. Lise Meitner in an interview with the German television, ARD, March 8, 1959. Professor Meitner stated that nuclear fission could be attributed to chemistry. I have to make a slight correction. Chemistry merely isolated the individual substances, but did not precisely identify them. It took Professor Hahn's method to do this. This was his achievement. Prof. Dr. Fritz Strassmann in the same interview with the German television, ARD, March 8, 1959. In postwar Germany, Otto Hahn became the most revered elder statesman of what had once been Europe's proudest scientific establishment. He collected many awards, including a Nobelprize in Chemistry for his discovery of fission. But he always accepted such honours with characteristic humility. Visiting an atomic reactor or nuclear power station, he would shrug modestly: 'It has all been the work of others.' In a soon-to-be-published 300-page memoir, he brushed off his historic workin fewer than five pages. Last week, at he age of 89, the father of fission died peacefully in his beloved Göttingen. TIME Magazine, New York, August 9th, 1968.